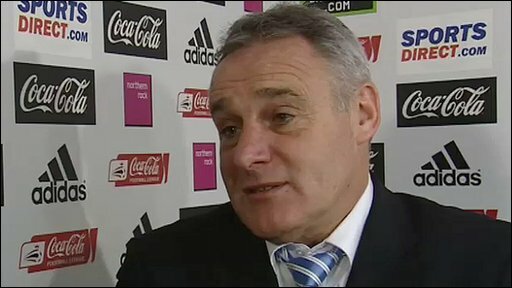 Newcastle brushed aside the challenge of Cardiff City to extend their lead in the Championship table to six points. Andy Carroll had a hand in the first three goals, which came in 15 minutes. The striker scored the first from close range, saw his shot off the post turned in by Gabor Gypes for an own-goal, then rose unmarked to head his second. After the break sub Peter Lovenkrands added two more, poking in before adding a fine curled second, with Aaron Wildig hitting a late Cardiff consolation. Former Magpies striker Michael Chopra had promised not to celebrate if he scored at St James' Park, but his restraint rarely looked like being tested on a black night for the Welshmen. Newcastle manager Chris Hughton fielded all six of his January transfer acquisitions in his starting line-up, and that meant debuts for Leon Best and Fitz Hall and a first appearance at St James' for Patrick van Aanholt. But it was one of the old guard who struck the first blow with just three minutes gone, after Gyepes had conceded a third-minute corner trying to stop Wayne Routledge. Danny Guthrie's cross was headed back across goal by Hall and flicked on by Kevin Nolan for Carroll to stab home from close range and give his side the perfect start. The 21-year-old striker should have collected his eighth goal of the season three minutes later when he smashed a left-foot shot against the foot of the post. But the unfortunate Gyepes could only help the rebound into his own net as the Magpies raced into a 2-0 lead. Ross McCormack might have pulled one back immediately for the visitors, but his stinging volley cannoned back off the bar. Carroll then claimed his second of the game when he met Danny Simpson's inch-perfect cross with an unstoppable header. Bluebirds full-back Adam Matthews drifted a 20th-minute cross on to the angle of bar and post with goal keeper Steve Harper once again beaten, but it was not Cardiff's night. The second half was never likely to start as explosively as the first, although Harper had to be on his toes to turn over Chopra's 51st-minute shot after it looped up off Hall. Dave Jones' men were enjoying plenty of possession, but were rarely able to trouble Hughton's rearguard. They were made to pay with 21 minutes remaining when Routledge fed Lovenkrands and he finished with aplomb, sliding the ball past David Marshall. Carroll was denied a hat-trick by Gyepes' 80th-minute goal-line clearance, but Lovenkrands made it 5-0 with a fine finish two minutes later. Cardiff substitute Wildig's late strike was scant consolation for the demoralised visitors, who never the less remain in the play-offs and have an FA Cup fourth-round tie at Chelsea to look forward to. One plus point for the Bluebirds was the return of midfielder Stephen McPhail, who played his first game - lasting 75 minutes - since returning from treatment for cancer. "Potentially he's [Andy Carroll] number nine material. He's a player who leads the line. "In some ways, he's an old-fashioned centre-forward who has a prowess in the air, but he's still developing. "He has good football skills for a big man, but what he has to add is goals and he was able to do that tonight." "Stephen [McPhail] has had the all-clear and I thought him being back today, he didn't look out of place. "Yes, maybe just a little half-a-yard but that will come with games, that will come with the more games he gets. "But he feels fit and he feels strong. I just didn't want to go into the last 20 minutes of that [second] half where he is drained and he pulls something again." 90:00+5:15 The match has reached full-time. 90:00+3:08 Corner taken by Chris Burke from the right by-line played to the near post, Mike Williamson manages to make a clearance. 90:00+3:03 The ball is swung over by Peter Whittingham, Patrick Van Aanholt gets a block in. 90:00+1:51 Free kick awarded for an unfair challenge on Darcy Blake by Peter Lovenkrands. Peter Whittingham takes the free kick. 90:00+1:30 The ball is sent over by Kevin McNaughton. 88:31 Assist by Ross McCormack. 88:31 GOAL - Aaron Wildig:Newcastle 5 - 1 Cardiff Aaron Wildig finds the net with a goal from inside the penalty box to the bottom right corner of the goal. Newcastle 5-1 Cardiff. 86:24 Unfair challenge on Anthony Gerrard by Andrew Carroll results in a free kick. Anthony Gerrard restarts play with the free kick. 84:50 Ross McCormack is ruled offside. Indirect free kick taken by Steve Harper. 83:56 Ross McCormack takes a shot. Save made by Steve Harper. 82:33 The ball is delivered by Wayne Routledge. 81:51 Substitution Tamas Kadar comes on in place of Fitz Hall. 81:14 GOAL - Peter Lovenkrands:Newcastle 5 - 0 Cardiff A goal is scored by Peter Lovenkrands from just outside the area to the bottom left corner of the goal. Newcastle 5-0 Cardiff. 80:07 Inswinging corner taken from the left by-line by Danny Guthrie. 79:36 Andrew Carroll takes a shot. Clearance by Gabor Gyepes. 78:14 Substitution Ryan Taylor joins the action as a substitute, replacing Jonas Gutierrez. 77:53 Darcy Blake has an effort at goal from outside the area missing to the wide right of the goal. 77:07 Danny Guthrie has an effort at goal from outside the box which goes wide left of the target. 76:36 Danny Guthrie takes the free kick. 76:36 Booking Gabor Gyepes receives a yellow card for unsporting behaviour. 76:28 Free kick awarded for a foul by Gabor Gyepes on Peter Lovenkrands. 74:41 Substitution Aaron Wildig is brought on as a substitute for Stephen McPhail. 72:00 Kevin Nolan takes a shot. Save by David Marshall. 70:44 The assistant referee flags for offside against Patrick Van Aanholt. Free kick taken by David Marshall. 68:04 Assist by Wayne Routledge. 68:04 GOAL - Peter Lovenkrands:Newcastle 4 - 0 Cardiff Peter Lovenkrands finds the back of the net with a goal from inside the penalty box to the bottom right corner of the goal. Newcastle 4-0 Cardiff. 67:07 Shot from 35 yards by Stephen McPhail missed to the right of the goal. 65:44 Peter Lovenkrands gives away a free kick for an unfair challenge on Gabor Gyepes. Free kick taken by Gabor Gyepes. 65:05 Free kick awarded for an unfair challenge on Mike Williamson by Michael Chopra. Direct free kick taken by Steve Harper. 64:06 The ball is delivered by Peter Whittingham, Mike Williamson makes a clearance. 62:54 Ross McCormack fouled by Danny Guthrie, the ref awards a free kick. Stephen McPhail takes the free kick. 60:49 Andrew Carroll is caught offside. Indirect free kick taken by Gabor Gyepes. 59:20 Substitution (Newcastle) makes a substitution, with Peter Lovenkrands coming on for Leon Best. 58:55 Michael Chopra takes a shot. Save made by Steve Harper. 55:43 Outswinging corner taken from the right by-line by Danny Guthrie, save by David Marshall. 55:18 Darcy Blake gives away a free kick for an unfair challenge on Patrick Van Aanholt. Steve Harper takes the free kick. 53:59 Mike Williamson gives away a free kick for an unfair challenge on Michael Chopra. Direct effort from the free kick comes in from Ross McCormack, blocked by Danny Simpson. 52:15 Unfair challenge on Mike Williamson by Michael Chopra results in a free kick. Steve Harper restarts play with the free kick. 50:24 Corner taken by Peter Whittingham played to the near post, save by Steve Harper. 50:01 Michael Chopra takes a shot. Fitz Hall gets a block in. 49:33 The ball is crossed by Andrew Carroll, Gabor Gyepes makes a clearance. 45:01 Substitution Mark Kennedy comes on in place of Adam Matthews. 45:00+3:09 The whistle is blown to end the first half. 43:31 Wayne Routledge takes a shot. Michael Chopra gets a block in. 42:27 Jonas Gutierrez is caught offside. Free kick taken by Anthony Gerrard. 41:48 Gabor Gyepes fouled by Leon Best, the ref awards a free kick. Anthony Gerrard takes the direct free kick. 39:33 Free kick awarded for a foul by Fitz Hall on Michael Chopra. Peter Whittingham takes the direct free kick. 38:00 Anthony Gerrard restarts play with the free kick. 38:00 Booking Leon Best is shown a yellow card for unsporting behaviour. 37:56 Free kick awarded for a foul by Leon Best on Stephen McPhail. 36:37 Peter Whittingham fouled by Danny Guthrie, the ref awards a free kick. Free kick taken by Gabor Gyepes. 36:00 The ball is crossed by Chris Burke. 33:31 Danny Guthrie takes a outswinging corner to the near post, Mike Williamson takes a shot. David Marshall makes a save. 29:24 Direct free kick taken by Gabor Gyepes. 29:24 Substitution Chris Burke is brought on as a substitute for Jay Bothroyd. 29:24 Free kick awarded for a foul by Leon Best on Peter Whittingham. 28:25 Danny Guthrie takes a shot. Save by David Marshall. 27:03 Free kick awarded for a foul by Jay Bothroyd on Kevin Nolan. Free kick taken by Steve Harper. 25:31 Danny Simpson gives away a free kick for an unfair challenge on Stephen McPhail. Direct free kick taken by Kevin McNaughton. 23:13 Andrew Carroll has an effort at goal from outside the box which misses left. 20:24 Short corner taken by Ross McCormack. 19:33 Adam Matthews sends in a cross. 19:17 Adam Matthews crosses the ball, Fitz Hall makes a clearance. 15:51 Peter Whittingham challenges Danny Guthrie unfairly and gives away a free kick. Free kick taken by Steve Harper. 14:47 Assist by Danny Simpson. 14:47 GOAL - Andrew Carroll:Newcastle 3 - 0 Cardiff Andrew Carroll grabs a headed goal from deep inside the penalty box. Newcastle 3-0 Cardiff. 13:14 Wayne Routledge concedes a free kick for a foul on Kevin McNaughton. Free kick taken by David Marshall. 11:50 Michael Chopra is flagged offside by the assistant referee. Indirect free kick taken by Steve Harper. 9:56 Stephen McPhail concedes a free kick for a foul on Wayne Routledge. Free kick taken by Kevin Nolan. 7:58 Ross McCormack takes a shot. 7:36 Peter Whittingham decides to take the corner short. 6:33 Fitz Hall challenges Jay Bothroyd unfairly and gives away a free kick. Peter Whittingham takes the direct free kick. 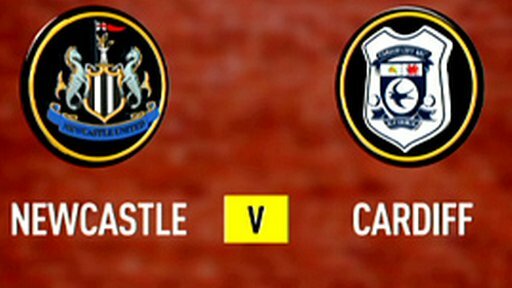 5:49 GOAL - Gabor Gyepes:Newcastle 2 - 0 Cardiff Gabor Gyepes scores an own goal from 6 yards. Newcastle 2-0 Cardiff. 5:27 Shot by Andrew Carroll from deep inside the penalty box bounces off the post. 4:35 Free kick awarded for a foul by Jay Bothroyd on Kevin Nolan. Direct free kick taken by Mike Williamson. 3:36 Foul by Kevin Nolan on Stephen McPhail, free kick awarded. Peter Whittingham restarts play with the free kick. 2:17 Assist on the goal came from Fitz Hall. 2:17 GOAL - Andrew Carroll:Newcastle 1 - 0 Cardiff Andrew Carroll gets on the score sheet with a goal from close in low into the middle of the goal. Newcastle 1-0 Cardiff. 1:56 Inswinging corner taken right-footed by Danny Guthrie from the left by-line. Correction - 0:28 Inswinging corner taken from the left by-line by Ross McCormack. 0:28 Corner from left by-line taken by Ross McCormack.